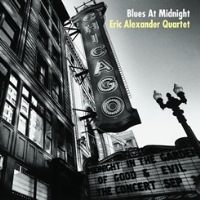 Description: The big star on the Venus Records' roster and one of the top tenor saxophonists of his generation, Eric Alexander's latest release is an all-blues album. Leading his regular quartet consisting of the powerful Harold Mabern on piano, Nat Reeves on bass and Joe Farnsworth on drums, Alexander weaves a tapestry of blues with wide-ranging materials. The choices of tunes are varied and interesting, including Horace Silver's "Sayonara Blues," two compositions by tenor saxophonists Gene Ammons and Stanley Turrentine. Then there is the powerful "Dis Here," the Latin-tinged "Caribe" by Wes Montgomery, and even the surprising '78 hit "Dance With Me" by Peter Brown. A fine outing by one of today's best jazz groups! This is a CD edition. The vinyl LP version is available here. Recorded at Sony Music Studios in Tokyo on March 11 and 12, 2013.